The cover is absolutely hilarious. Poririn is dressed in 16th century-style dress, with a ridiculous mustache drawn on his face and a sword and three- cornered red hat. Quite fetching, really. 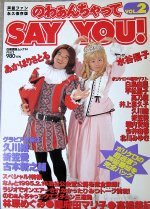 Kerorin has a long pink dress, again in 16th century-style. She's making a ballet-like movement with her hands. There are two "pinups" just inside the front cover. One is just of Kerorin in a tank top and shorts. Nothing too revealing though. The other is of Kerorin and Orion (Orikasa Ai) with cat-like makeup and cat-eared tiaras. The caption says "mipple" (with an "m", not an "n", you hentais!). There are color photo sections of Hisakawa Aya, Furumoto Shinnosuke, and Orikasa Ai. Coverage of the 95.02.16 Nowanchatte Say You event in Shibuya. Guests included Hayashibara Megumi, Kouda Mariko, Takahashi Miki, Hiramatsu Akiko, Imai Yuka, and Horiuchi Ken'yuu. More color phots of Pori-Kero in normal clothes. It includes clips from some kind of video with them in their Elizabethan costumes. In Volume 1, they had a bowling challenge. This volume, they have a pachinko challenge. They both lost.